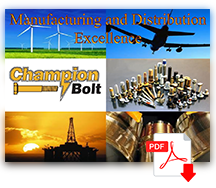 Manufacturing - Champion Bolt, Inc.
Champion Bolt can provide virtually any fastener-related product you need. We can modify items in-house to meet your specifications. Our state-of-the-art manufacturing center offers a wide range of capabilities and options to suit any project.